The Raspberry Pi is a small credit card sized computer originally designed as a cheap easily available platform to aid in teaching of computer programming in Schools. The boards have become very popular with hobbyists, due to the cheap price, and the variety of uses the computers have. 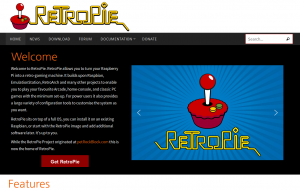 RetroPie has a brand new website – https://retropie.org.uk. Although the old site living under http://blog.petrockblock.com has served us well over the last years, the forum was becoming increasingly slow, and the project really needed its own presence. Hopefully you will like what we have come up with – a simple site with general info, and a new forum running off nodebb – which is not only fast, but also works much better on mobile devices. The old forum posts have not been moved, as we decided it would be better to start with a fresh layout, and it would have made the migration far more complicated. You can however access the old forum via http://blog.petrockblock.com/forums/forum/retropie-project-forum/. Thanks to our excellent hosting company Mythic-Beasts who have sponsored us by providing additional resources and bandwidth. You can find out a bit more on our Hosting Information page. We are pleased to announce the release of RetroPie 3.5. After taking into consideration the feedback from the vibrant RetroPie community, we have provided a few more functions to simplify the user experience such as automatic expansion of the filesystem on boot, less terminal text, and more configuration options for the runcommand launch menu. We have also fixed up some bugs with Raspbian Jessie such as the USB ROM service and have added two new experimental modules – the Löve game engine and a ColecoVision emulator (CoolCV). Prebuilt images are available from the main RetroPie website – http://blog.petrockblock.com/retropie/retropie-downloads/, or can be grabbed from GitHub – https://github.com/RetroPie/RetroPie-Setup/releases/tag/3.5. You can also install RetroPie on top of an existing Raspbian Jessie / Raspbian Wheezy set up – Instructions can be found at the GitHub project site. The Raspberry Pi show The Pi Podcast did an interview with me and two other members of the RetroPie team for Episode #13. Big thanks to them for inviting us on the show. If you own a Raspberry Pi or are thinking of getting one, then you should definitely check it out. They release a new show roughly every two weeks, with Raspberry Pi related news, chat and interesting interviews. It is professionally produced, and hosted by three knowledgeable and friendly Raspberry Pi enthusiasts.